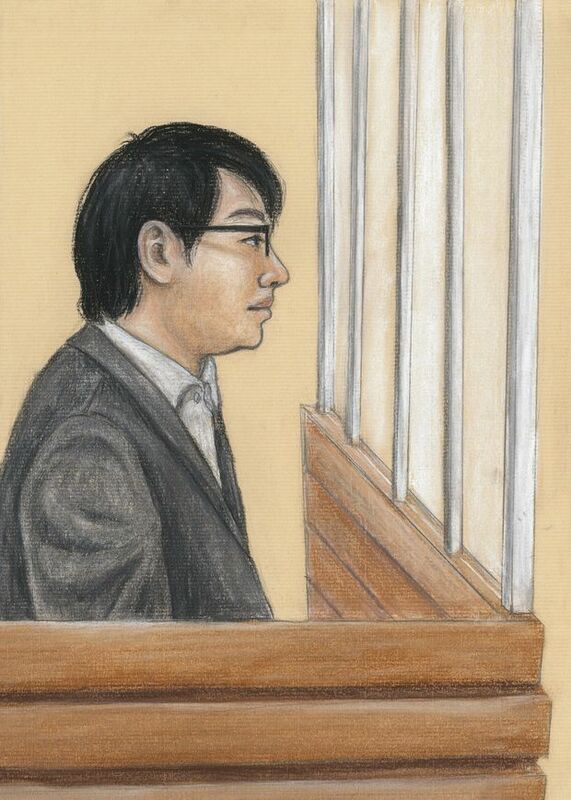 Courtroom sketch of Zijie Wang, a 26-year-old PhD candidate of Queen's University, charged with poisoning his college roommate. Zijie Wang, a 26-year-old PhD candidate shuffled into court, his legs shackled, and sat silently listening to his former lab partner. Mr. Wang pleaded guilty last week to aggravated assault and administering a noxious substance. The Crown is seeking seven years in prison for Mr. Wang. The defence argued on Friday for a four-year sentence. The two men were once roommates and had worked side by side in the same lab, and even co-authored a scientific paper. They had a falling out in 2017 when they lived together. The victim said Mr. Wang held a party without his permission and left a huge mess, after which he decided to move out and distance himself from Mr. Wang. “What kind of hatred would make a person attempt to kill his roommate by putting a highly toxic compound in his water?” the victim asked in court. There is no real answer, Mr. Wang’s lawyer, Brian Greenspan said. There is nothing in his psychological profile to explain it, no evidence of anything other than a bright, intellectually inquisitive student, he added. The victim first noticed something awry in early January. He had an apple pie that he’d brought to the lab for lunch, but noticed a bitter taste. Shortly after, he started to feel sick and spent most of the afternoon violently ill until he fell asleep at his desk. The pain and sickness continued until the middle of the night, he said. A week later, an almost identical scenario played out. He noticed a bitter taste in his pie and stopped eating. He thought the problem was the pie. The next week, he brought half a loaf of cinnamon-raisin bread for lunch, and again remarked on the bitter taste and a chemical smell. He brought the bread home and compared it with the other half of the loaf, which didn’t have the same chemical scent. A few days later, he drove home to his wife and children, who live near Toronto, and found that his water bottle tasted peculiar. He stopped drinking but, suspecting foul play, kept the liquid. The victim went to his lab supervisor and told him he suspected he was being poisoned. His supervisor gave him permission to set up a hidden camera at his desk. The hidden-camera footage was played in court on Friday. It shows Mr. Wang approaching the victim’s desk at a time when the rest of the staff is in a meeting. Mr. Wang is wearing a white lab coat and blue plastic gloves. He holds a vial in one hand and a pipette in the other. He roots around in the victim’s bag, his manner deliberate, his face betraying no emotion. He returns to the bag four times, each time apparently administering liquid from the vial. Back in January, the victim watched the video and showed his supervisor, who contacted the head of the department, and eventually university security and Kingston police. The judge in the case will have to consider in his sentencing that the long-term harm to the victim cannot yet be known. But the planning and deliberation in the attack, Mr. Wang’s knowledge of the substance and its risks and the fact that he carried out the attacks repeatedly are also aggravating factors, Crown prosecutor Janet O’Brien said. The victim and the offender used the same translator in court, something Mr. Greenspan said he had never heard of before, but which helped speed the court process. Mr. Wang will be back in court for sentencing Dec. 11.